A thunderous round of applause is due to Ben Wagman (Alan's son) for participating in the Penguin Plunge on January 27th. 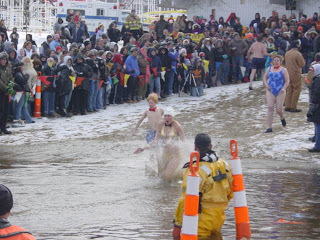 The Penguin Plunge is an annual fundraising event benefiting the Special Olympics Connecticut. 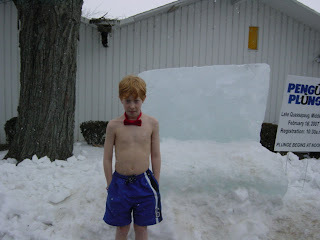 Participants run, jump or dive into near frozen water wearing only a swimsuit and a bow tie! This year, special equipment had to be brought in to break through the ice to allow participants to careen into the 36 degree water. At last count, Ben had raised well over $500 in cold, hard cash for the Special Olympics Connecticut and in support of his brother, Evan, who has Down Syndrome. Last year Evan participated in track and field events at both the regional and state level in the State Summer Games. That's incredible. What a tremendous achievement - way to go, Ben! I concur. All the Wagman Men should feel very proud!